A little while ago I asked about GoPro file sizes to judge how much memory is needed to record all dives on a trip in their entirety. I couldn't find any real numbers online so when my GoPro hero 3 black came in yesterday I decided to do the experiment for most formats and frame rates. The somewhat surprising results are listed below. Only 3 different file sizes were observed at approximately 9, 13.5, and 20GB/hr. For instance all frame rates at 1920x1440 resolution yield 13.5GB/hr and 1920x1080 at 30 frames/sec actually gave a smaller file than at 24 frames/sec. I can't say I understand this, especially the latter, but it suggests that compression rates are adjusted to make each recording mode fit into one of those three data rates. After I convert the GoPro files to .avi with the GoPro software the file sizes do start to become different and in line with expectations based on resolution and frame rate (last column, but I didn't convert all of them and on first try the 2.7K and 4K modes didn't want to convert at all). The good news is that my intended 1080p @ 30frames/sec gives the smallest file and with 9GB/hr even my long shallow dives should fit on the 16GB card I bought. Even the 13.5GB/hr data rate will capture at least most of any typical dive. I also looked at clips using the wide/medium/narrow FOV settings and I thought the quality of all of them looked good (I read somewhere the narrow FOV modes looked poor). I will look at image quality, actual FOV of the narrower modes, and closest focus distance in more detail later but so far I am very impressed. I also got my new Oly OMD EM-5 this weekend so they are fighting for my attention. Lots to read and experiment with before my May 22-June 5 Red Sea trip. I expect to log about 50 dives and some 60hrs under water so the current plan is to get a second 16GB card and a 2TB Western Digitial 2.5" MyBook drive (about 200gram and it is powered through the USB cable). That should give ample space for video records of all dives as long as I keep them in GoPro format. If the winter next year lasts as long as this one I will at least have lots of footage to look at. PS: I got my 16GB Sandisk class 10 micro SD card from "The Source" for just 20 bucks. The normal price was $60 and the camera store tried to sell me a 8GB no-brand card for $25. Seems to be a good deal! Edited by Glasseye Snapper, 14 April 2013 - 12:14 PM. just created an account in this forum to thank you. really appreciate your effort in testing this. just got myself a hero3 black which is now cheaper in Malaysia and Googled for file sizes. your post has definitely helped! I have to go for a trip tomorrow but once I am back, i'll key in the data in an excel/spreadsheet and share the image or perhaps Google Docs so it can be updated and shared for others too. a possibility is to test the filesizes for other models too, and create an online spreadsheet for this. Thanks for this research. I formatted your information above in this graphic. I find it very interesting that 1080p/24fps is higher video rate than 1080p/30fps. 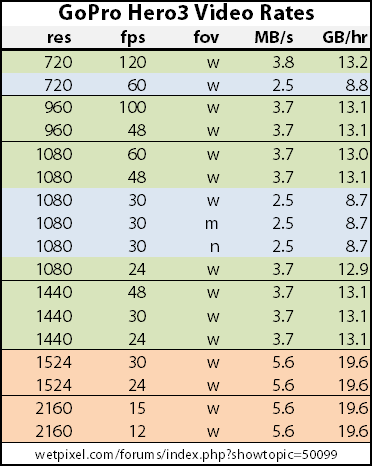 I found your information while trying to determine if filming at 1080p/60fps was the cause of the noise I was seeing in dark regions of a 90' dive, and if switching to 30fps would help low-light conditions. I'm not sure that this answers the question directly, but I did find a video with side-by-side (above-water) Hero3 footage comparing 1080p/60fps with 1080p/24fps under low light. The results were that the 24fps certainly was better in low light, but the rolling shutter was far more prevalent in the 24fps. Next dive I take I'll try to cycle through various modes and compare the deep water/low-light behavior of the various frame rates. Edited by Phrogz, 23 January 2014 - 12:07 PM.